Is it Thursday already?! It's Day 4 of the Spring 2017 10x10 Challenge hosted by Un-Fancy and Style Bee. If you want to know more about it or jump on board (it's not too late! ), you can get info and inspo here. I wanted to chat a little bit about what's not included in a capsule wardrobe or the Spring 10x10 Challenge today. For those who know me, know I'm an accessory junkie. Before starting a capsule wardrobe, I would go shopping and come home 2 hats, a scarf, a pair of shoes, and handful of rings... absolutely no pants or shirts. Seriously, what am I going to wear? Honestly, I could probably fashion something with just the accessories and be completely covered. The point is this: The idea of doing a capsule wardrobe or this challenge is to minimize. To simplify. I realize I still have a ton of closet clutter with the "stuff" not included. So this challenge for also encourages me to limit the amount of pieces in the "not included" category. If you're like me, keep reading. Today, I just want to look at what I consider the Essentials +: Base layers, belts, bags, hats, and scarves. The essentials are base layers, belts, and bags. With day to day life and many of my outfits, I need these things to function. I prefer to function without a bra but I think the people around me prefer if function with it. The + are hats and scarves. I don't need them in day to day life but I like to have them as an option. They can totally change up the look of an outfit. As far as function, sometimes I just need a hat to tame my mane or hide the fact I haven't washed my hair in 5 days. 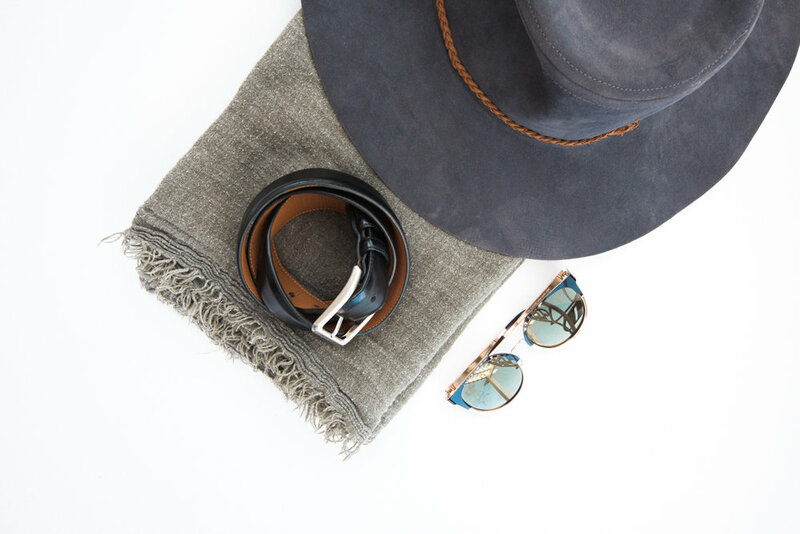 Scarves can give you just the right amount of warmth with an outfit. For even more, follow along my Instagram story @janierocek. Be sure to check out Caroline and Lee's daily posts. Join the fun on Instagram #spring10x10 #unfancyremix #stylebee10x10. Stay tuned for some upcoming posts on adding in beauty to the mix and more daily outfits. Have a great day!